"Abandoned as a child and adopted by a German circus, Kurt Wagner became a high-flying acrobat known as the incredible Nightcrawler! When Professor X assembled a team to rescue the missing original X-Men, Nightcrawler answered the call, finding a new family and becoming a hero." With a puff of smoke and brimstone, Nightcrawler teleports away from danger and into position to strike. Converts up to 4 basic tiles to the color most present on the board. (PASSIVE) If the enemy would deal team damage to Nightcrawler, make him Airborne for 1 turn instead. (Level 2) Converts up to 5 basic tiles. (Level 3) Converts up to 6 basic tiles. (Level 4) Converts up to 7 basic tiles. (Level 5) Converts up to 8 basic tiles. 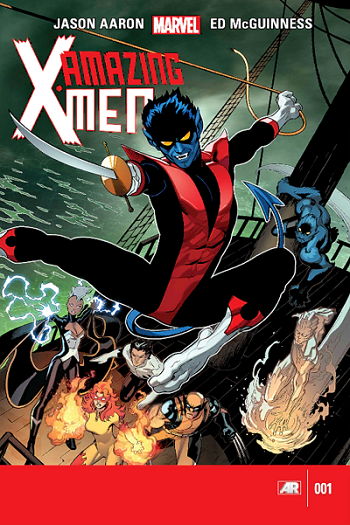 Nightcrawler swings dual sabers with a smile on his face, swashbuckling with superhuman agility. Deals 1461 damage. If you have 12 or more AP in your strongest color, deals 2778 damage instead. (Level 2) Deals 1984 damage...color, deals 3482 damage instead. (Level 3) Deals 2525 damage...color, deals 4203 damage instead. (Level 4) Deals 3337 damage...have 10 or more AP...color, deals 5321 damage instead. (Level 5) Deals 5050 damage...color, deals 8118 damage instead. Leaping in and out of the shadows, Nightcrawler uses his enemy's confusion to disarm and disorient. Deals 271 damage for each point of AP in the Enemy's strongest color and steals 2 of that AP. (Level 4) Deals 614 damage...steals 3 of that AP. (Level 5) Deals 614 damage...steals 3 of that AP. What do you think is Nightcrawler's best build? Vote down below! I still think it's silly that a power called "Everywhere At Once" doesn't damage the whole enemy team. Did they just hotfix his Blue? It's considerably more appealing now, in terms of it's damage potential. Still, the limit on targeting the enemy's strongest colour only (compared to the largest pool like Mordo) feels like just a bit too much of a limitation for me, so I'll stick with 5/5/3 as preferred build for now. Can you ask the devs to add an indicator to his Purple? This way we don't have to count tiles to see what basic tiles will be created. They can use the recent Lockjaw as an example. His blue also uses the most color tiles on the board and the ability tells you, so they should be able to code it. We need to know if purple when purple is the most common tile color to create more purple into infinity is intended or now. I like this! It's not like the AI is able to exploit it in defence battles since they only trigger the same skill once / turn. AI has never been able to exploit winfinite, for that exact reason. I'm thinking that's not what they're worried about. Can you ask the devs to add an indicator to his Purple? This way we don't have to count tiles to see what basic tiles will be created. They can use the recent Lockjaw as an example. His blue also uses the most color tiles on the board and the ability tells you, so they should be ability to code it. Sure thing! I'll pass that feedback along to them, and see if that's something they can include. Shouldn't be that hard. At worst, it's the same as Lockjaw, with a totally different description string for each color, that happens to be the same word for word except for the indication of color. Also, this is an awesome format for a character details post. Nightcrawler is still underleveled, but he's been fun when climbing in the Eye for and Eye (3* Cyclops) PvP event. Play Cyc yellow - which should guarantee that red is now the most plentiful on the board, then play Nightcrawler purple. Oh man, it turns into a red explosion. You will be able to fire Cyc red after this of course (maybe twice), but what's funny is, when a random line is destroyed by the optic blast, you'll probably make even more red matches from those that were left standing. And surprisingly enough, his blue came in quite handy a few times when the enemy Cyclops got up to 10 red. Yep, he will be a good second for anybody who generates color tiles, C&D, Scarlet Witch, Cyclops, Sandman (except you might want to max his yellow). I still do not see him as being a great character but he can feed one color very well and on the right team he might be devastating. No love for the Bamf!? Yeah, not really a fan. It's too bad - Nightcrawler is such a beloved character. But somebody's gotta fill the lower half of the tier. GASP. He's amazing. I'm bamfing around everyday and they're hatin'. He seems really fun and it seems like he could make a good teamate for a new winfinite team, but I don't have him champed to test it out (plus to work how I'm thinking He's have to over level my 280 Prof X). Outside of that he seems pretty niche character at best, but he does seem fun. Bamfinite isn't a real thing, no matter how many claim to have done it on these boards. I don't doubt that it can happen, I doubt that it's a reliable strategy. Any strategy that relies on a color being present on the board leaves too much in the hands of randomness. Magfinite - that was real. Stormfinite - that was real. Ragfinity - that is real. Bamfinite? Meh. It's not about relying on any one color. It's about relying on the likelihood that creating large numbers of tiles in the color that's already the most prevalent creating some to many crit tiles that Charles channels into more purple to keep generating more of that color. What color it is has no bearing, just as long as crit tiles get made. It's not about relying on any one color. It's about relying on the likelihood that creating large numbers of tiles in the color that's already the most prevalent creating some to many crit tiles that Charles channels into more purple to keep generating more of that color. That's a strategy that can be relied on. I like it. Like I said it needs to be run through the paces and my roster is no where near ready for it. Theory is bring Switch, Champed Prof X (but lower leveled than Nightcrawler) and champed Nightcrawler. Switch will ensure Nightcrawler get's his purple of the ground, Nightcrawler creates crit tiles that Charles adds extra damage an AP to. Nightcrawler's purple is his strongest so as long as he's high enough level that purple is highest over all Charles will continue to back feed purple (not to mention switch will also continue to do so). Well NC takes a bit of planning around knowing the enemy teams strongest color, your teams strongest color, and whether you will face enemy AoE attacks. I definitely understand how this is too much for most of us to worry about. However, NC plays quite well vs Thanos. The green CD cannot hurt NC, and if it goes off on your team and it downs someone, he will be airborne to avoid this damage as well. Too bad his health is quite low, so Thanos will be sure to injure him a bit from that alone. But this is not what makes this match up good. Nightcrawler's blue will do significant damage if black is the enemy teams strongest color and they have no way to spend it (often the case on Thanos teams). Or, plan to down a different enemy that uses black before they can fire this power so black continues to build up. NC's blue can hit for nearly 15K if they have 18-19 black AP. That is a whole lot, but NC blue should probably be considered a final blow power to end the match anyway. At 5 covers in red, it only takes 10 AP in your team's strongest color to hit for good damage, costing only 9 red AP. I usually set his purple at 3 covers, and use it when there are clearly a large amount of a color on the board that would help you. I think many people would just bring NC along for matches where you would only plan to be using his purple, due to his other powers taking a lot of planning to rely upon. In this case certainly you would set it to 5 covers. He actually pairs well with TA Hulk - and vs. TA Hulk. Since you are saving blue for Cho's big green punch anyway, NC can use it once you are done punching. Cho's black helps to charge blue tiles for easy building, and once the CD adds green to the board, use NC's purple to add even more green to cascade everywhere. Enemy Cho get a lot of green? Great, if it's their strongest color. Who else have you been paring him with? C&D to bamf some crazy black? Others? My Nightcrawler passed Professor X in champion levels some week ago but I still haven't tried your mentioned strategy. I'll do later today if I can find a non Rocket & Groot + Gamora team in the Simulator. Oh, if we had some kind of arcade mode where we could pick our own opposing team for playing around. Did you end up testing this? The 3rd partner is switch. She generates the purple to get Bamf started as well as sometimes triggering her own cascades. That was her role in the original winfinite and it wasn't a problem. I wouldn't worry too much about that. Her blue also got nerfed since then. Not as reliable anymore. Yup, one of those things I'm finding out about after 6 months off.